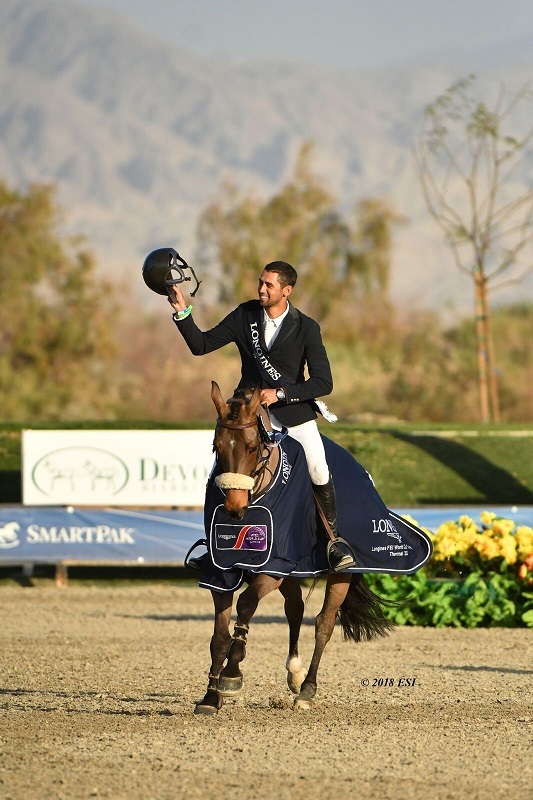 HITS » Longines FEI World CupTM Jumping Thermal - It's a Wrap! 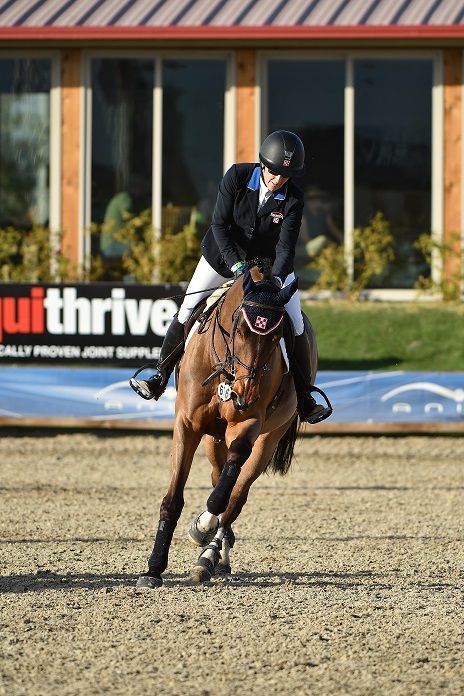 Longines FEI World CupTM Jumping Thermal - It's a Wrap! 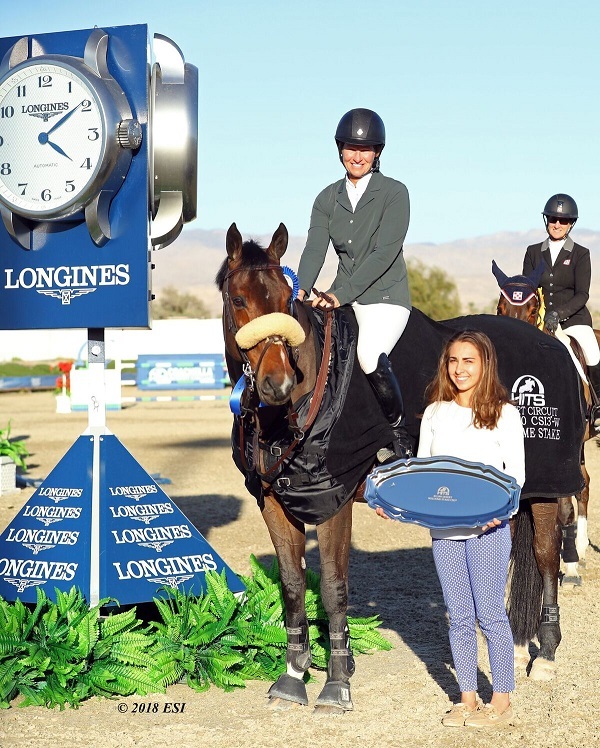 Desert Circuit IV was a special week as HITS held the Longines FEI World CupTM Jumping Thermal at the HITS Desert Horse Park. Riders from across the country and around the globe joined us in hopes to qualify for the World CupTM finals to take place in April. The World CupTM Qualifier was an important event for many exhibitors as this was the last qualifier class for the season on the West Coast, with there being just one more chance to qualify on the East Coast. 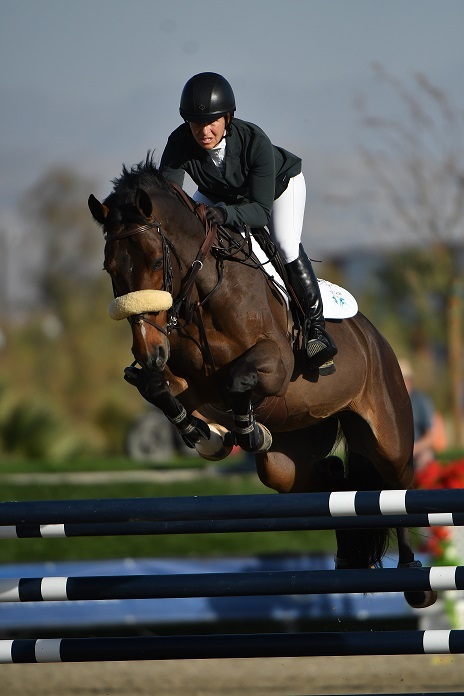 We kicked off the FEI Division on Thursday with the $35,000 Desert Welcome Stake CSI3*-W. Beezie Madden representing the USA rode to a first place finish aboard BREITLING LS, owned by Abigail Wexner. Madden and her partner traveled across the country, from Wellington, Florida, to secure the blue ribbon with a clear jump-off in 37.42. Madden is a familiar face to see at HITS. 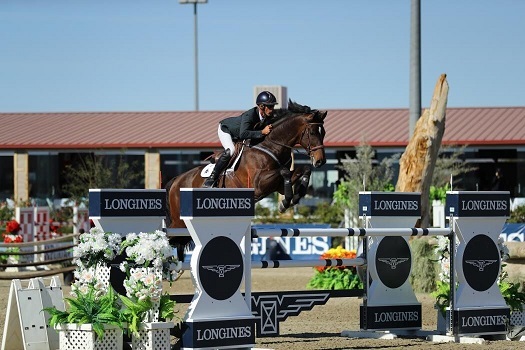 She has won the Saugerties $1 Million Grand Prix at HITS-on-the-Hudson in Saugerties, New York and competed in the Longines FEI Nations CupTM USA that HITS has hosted at HITS Post Time Farm in Ocala, Florida four times. The second place ribbon was won by Nayel Nassar representing his home country of Egypt, aboard a horse of his own, LORDAN, with a clear jump-off in 38.46, followed by Mandy Porter, a California native, representing the USA and MILANO, owned by Abigail Archer, in third with a jump-off time of 38.91. $35,000 Desert Welcome Stake CSI3*-W class! In the second FEI Division class of the week, the $40,200 Desert Classic CSI3*-W, Richard Spooner, known as "The Master of Faster", representing the USA, and ARTHOS R would jump to a first place finish in 37.72. Second place would be claimed by another rider representing the USA, Karl Cook and CAILLOU, finishing in 39.00. Rounding out the top three in the class was Canadian rider Ali Ramsay and CASINO, less than one second behind Cook in the jump-off with a time of 39.53. 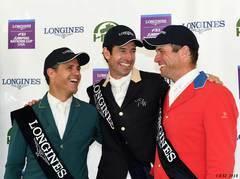 Spectators filled the stands on Saturday afternoon for the featured class of the week, the $100,000 Longines FEI World CupTM Qualifier, to watch a talented field of riders compete for the Champion title. Six riders would return after Round One for what was bound to be a competitive jump-off. Capturing the win was the team who has done it before, Nassar and LORDAN, with a clean jump-off in 39.02. Other than this being his second World Cup win here at the HITS Desert Horse Park, Nassar said, “This is definitely the biggest class in the first part of the circuit. It’s nice to jump for World Cup points and to be able to jump this level and jump Alan Wade’s courses,” when speaking to why this class is so special. “He’s such a trier and we know each other so, so well at this point, you know, with all the little intricacies of each course, we have such a good partnership to work through that” Nassar described his relationship with LORDAN, who is the same horse that he won on in 2016. 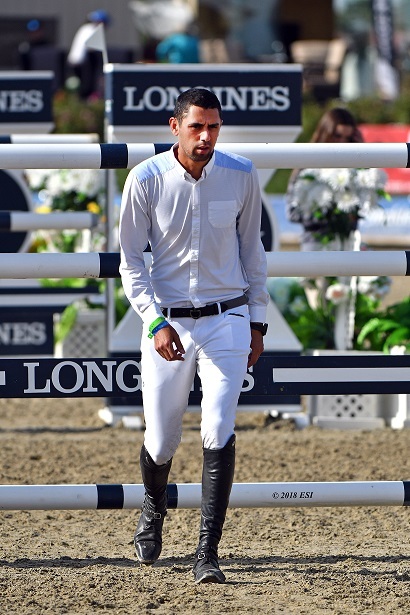 Nassar walking the course prior to the first round of the World Cup Qualifier. Nassar and LORDEN take a lap of honor after winning the Longines World CupTM Qualifier. 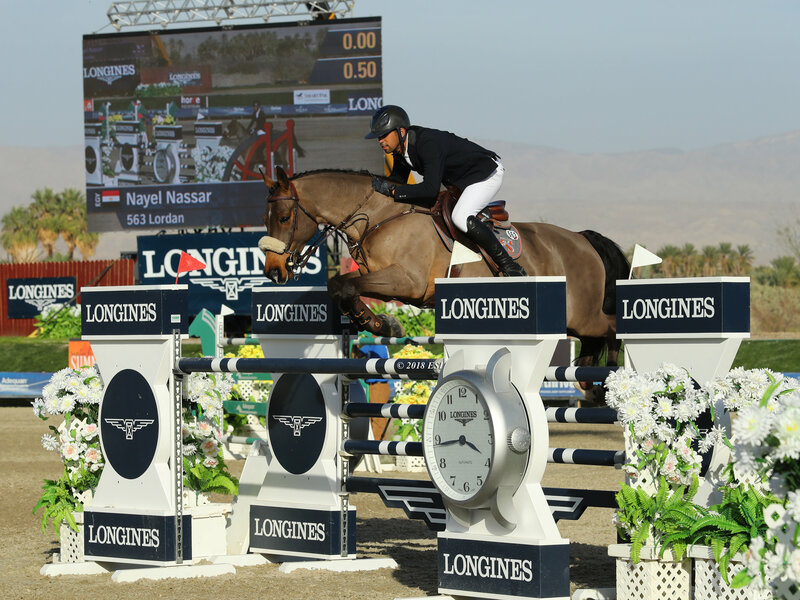 Nassar and LORDEN soar over the Longines fence to secure their first place finish. Taking home the second place ribbon in the class was Madden aboard BREITLING LS with the strategy to “just to go my [Madden] fast pace that I can go. He [BREITLING LS] has gotten pretty quick and I knew that there were a lot of fast horses in the jump-off so there wasn’t really much strategy to conserve anywhere. I don’t know that I would have done anything different if I had gone after Nayel [Nassar].” Madden jumped to the second place finish in a naturally fast time of 39.92, less than a second behind Nassar. Madden and BREITLING LS jump to a second place finish. Porter pleased with MILANO's performance, finishes in third.